Very Good Not visible to the unaided eye. Good May be visible to the unaided eye. Fair Visible to the unaided eye. Poor Visible to the unaided eye. To the unaided eye, 'excellent' and 'very good' ratings are hard to decipher. The differences become visible only when a stone is magnified. A rating of 'fair' or 'poor' means that the flaws in the polish are noticeable to the unaided eye and will have some effect on the overall beauty of the diamond. Poorly polished facets may reduce the intensity of a diamond's reflected light or light which is refracted into and out of a diamond. This can affect the brilliance and visual performance of diamond. When a diamond has a 'good' or lower polish grading, the stone may appear as if it needs to be cleaned. 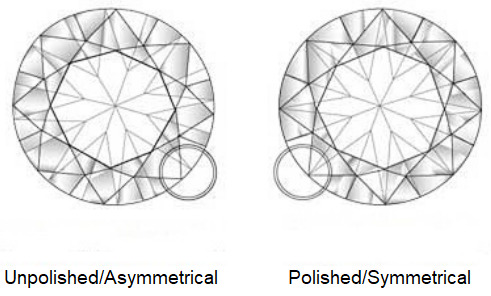 For diamonds with clarity grades of I1 or lower, even a polish grade of Fair is acceptable, since these diamonds already possess internal inclusions* that are visible to the naked eye, making any polish markings less relevant.